The Greek situation was a very special challenge to the economic hegemony of the trans-national investment system that runs the world. The fact that Greece took a stand is singular. The fact they were defeated is, no doubt, inevitable. What to do in a world of such inevitabilities? Invent new options, work creatively with others, build solidarity, research rigorously. Build your own solutions. Work with the tools we are given. Reboot and reconfigure. And never stop critiquing (others and oneself). We can take heart in the fact that the following news articles, and many others, have shone a light into the monolithic and fascistic economic entity that controls Europe. This is a new thing; it is progress. Europe has now revealed itself for what it is. I, for one, remain optimistic. Every step forward may also involve a step back. But the most important thing is just to keep moving. When someone lends money to someone else with the intention of making a profit, they take on a risk, as does the person borrowing the money. Because both sides take on a risk with the hope of some future gain, they ought to share responsibility for the outcome. This is why debtor-prisons –- common in the 18th and 19th centuries -– were abolished: they unfairly punish one party for a scenario created by both lender and borrower. However, neither Europe's banks which took on risky debts, nor the political institutions which made the policies that encouraged unsound financial practices, are willing to accept any responsibility for the current situation. Leigh, Joseph, Lewis Bassett, and Michael Walker. 2015. "In defence of Greece: 6 myths busted", Novara Wire [website], 19 June 2015. Dearden, Nick. 2013. "Greece and Spain helped postwar Germany recover. Spot the difference. ", The Guardian [website], 27 February 2013. What happens in an election? Consider a much-simplified analysis of an unjust system, on only two axes. We can say that some people are "rich", which means that they have ample disposable income, and others are "poor", which means they have insufficient money for life's essentials. On the other axis, some people are moral, in that they consider the ethical implications of their actions. Others are amoral, prioritising self-interest over other concerns. What happens in an election or plebiscite? The amoral rich will not vote for change, since they are profiting by it. Some moral rich might well vote for reforms, since they will start off in any new system with an advantage that they will likely retain. The moral poor will vote for reform, hoping they can then do better. The amoral poor generally vote with their rich counterparts, since they trust that one day they will be top dog. Governments and other institutions of capital convince the middle classes that they can be rich, feeding them false hopes. They then treat them in the same way as amoral poor, creating an environment of fear and envy in order to get the results they wish. Varoufakis, Yanis. 2015. "How I became an erratic Marxist", The Guardian [website], 18 February 2015. A young Greek man visits the Australian consulate in Athens and asks for a work visa. "Why do you want to leave Greece?" asks the official. "For two reasons," replies the Greek. "First, I am worried that Greece will leave the EU, which will lead to new poverty and chaos in the country..."
"But," interrupts the official, "this is pure nonsense: Greece will remain in the EU and submit to financial discipline!" "Well," responds the Greek calmly, "this is my second reason." Žižek, Slavoj. 2015. "Slavoj Žižek on GReferendum: The Greeks are correct", Analyze Greece [website], 6 July 2015. 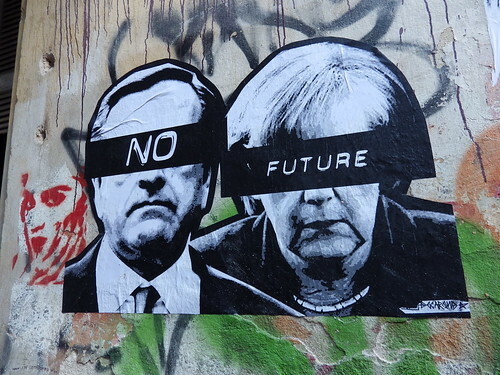 By infantilising Greece, Germany resembles a child who closes its own eyes and thinks we can not see it. We can. The world is watching what is being done to Greece in the name of euro stability. It sees a nation stripped of its dignity, its sovereignty, its future. What kind of family, we might ask, does this to one of its own members? Suzanne Moore. 2015. "The euro 'family' has shown it is capable of real cruelty", The Guardian [website], 13 July 2015. Democracy in action? The rule of law? No. What we have is a non-existent group that has the greatest power to determine the lives of Europeans. It's not answerable to anyone, given it doesn't exist in law; no minutes are kept; and it's confidential. No citizen ever knows what is said within... These are decisions of almost life and death, and no member has to answer to anybody. We went to a war thinking we had the same weapons as them [The Troika]. We have underestimated their power... It's a power that enters the very fabric of society, the way people think. It controls and blackmails. We have very few levers. The European edifice is already Kafkaesque. Salmon, Chris. 2015. "We underestimated their power: Greek government insider lifts the lid on five months of 'humiliation' and 'blackmail'", Mediapart [website], 8 July 2015. "There was point blank refusal to engage in economic arguments. Point blank. You put forward an argument that you've really worked on, to make sure it's logically coherent, and you're just faced with blank stares. It is as if you haven't spoken. What you say is independent of what they say. You might as well have sung the Swedish national anthem -– you'd have got the same reply." Lambert, Harry. 2015. "Exclusive: Yanis Varoufakis opens up about his five month battle to save Greece", The New Statesman [website], 13 July 2015. He said that the "greatest nightmare" of those with large debts –- the governments of countries like Portugal, Spain, Italy and Ireland –- "was our success". "Were we to succeed in negotiating a better deal, that would obliterate them politically: they would have to answer to their own people why they didn't negotiate like we were doing." If this counts as a victory for the European project, it is hard to imagine what a defeat would look like. Irwin, Neil. 2015. "The Greek deal poses dangers for Greece, and for Europe", The New York Times [website], 13 July 2015. Thanks to Julia Tulke for the photo of street art, by Scarr One, taken in Athens in 2013.